Residents and visitors to Brisbane’s inner western suburbs looking for a friendly, accessible place to meet for breakfast on a Saturday morning now have a new option. The recently refurbished Jay’s Café, the food heart of Raymont Residential College and the Uniting Church Centre at 60 Bayliss Street, Auchenflower, has opened its doors to the public and will extend its opening hours to include Saturdays from 13 October. 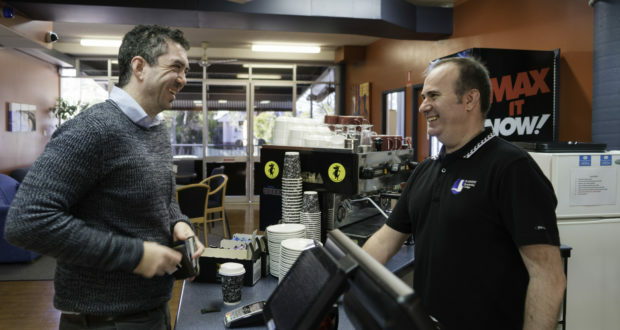 With the historic McIlwraith Croquet Club, a Scout hall, two private hospitals, Memorial Park, Wests Bulldogs Rugby and the NAB basketball stadium just down the street, café manager Jason Salway hopes to see locals and visitors make use of the café. Jay’s offers a personal touch; which Jason believes sets the café apart. “At other places you are simply a number, but at Jay’s we like to get to know our customers,” Jason says. The leafy campus has been owned by the Uniting Church (formerly the Methodist Church) since the 1940s, and includes the heritage-listed mansion Drysllwyn. Currently the functions coordinator at Raymont Residential College, Jason first started working with the Uniting Church in 1991 initially as an accounting assistant, before moving into the bookshop and finally into hospitality services at Raymont Residential College in 2004. Earlier this year, Jay’s Café was named in his honour as a tribute to his longstanding service to the church in Queensland. When asked what has kept him working at the Uniting Church Centre for so long, Jason replied with just a couple of words. Jay’s Café is open Monday to Friday between 7:30am–3:00pm and 7:00am–12:00pm on Saturdays from Saturday 13 October. To celebrate, a two for one coffee deal will be offered on Saturday 13 October. For more information, visit the Jay’s Café Facebook page.